Filmmaker Grace Lee’s latest documentary, “Off the Menu: Asian America,” is a swift but engaging look at several personalities and practices that comprise a very small part of a complicated culinary landscape in the United States. Growing up in Missouri in the 1980’s, Lee – who narrates the entire film in first person – voices her healthy (unhealthy?) skepticism of the Asian food she ate with her Korean American family. For her, the line has blurred between cuisines, which at times is reduced to photos, Yelp reviews and, of course, pictures of fellow Asians taking pictures of food. To learn how seemingly absurd ideas such as chipotle tofu egg rolls came to be, Lee travels through Texas, New York, Wisconsin and Hawai’i, following her interview subjects and chatting with them during behind-the-scenes factory tours, grocery shopping trips and taste tests for new items influenced by informal market research. As such, the story arc gradually evolves from thumbing one’s nose at a growing menu of Americanized Asian fusion cuisine to something much greater in meaning. The notable shift in tone occurs during her visit to the Sikh Temple of Wisconsin in Oak Creek, site of a mass shooting in August 2012. Conversations with congregation members about the tragedy and the concept of the langar – a communal kitchen from which food is served to all visitors, regardless of religion, for free – serve as the segue between the earlier segments and the later ones to illustrate how food simultaneously addresses community, family, personal history, tradition and Asian America. 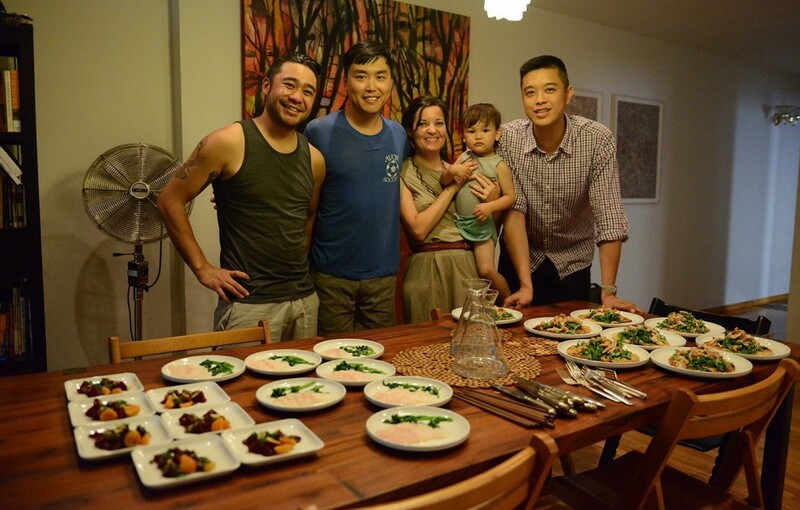 As Jonathan Wu, chef and co-owner of New York’s Fung Tu, puts it in the film, Asian American cuisine is all about the “authenticity of spirit.” That phrase alone could serve as the advertising slogan for Lee’s educational film. “Off the Menu: Asian America” screens at the 2015 San Diego Asian Film Festival on Sat., Nov. 14, at 3:20 p.m. For ticket information, go to festival.sdaff.org.